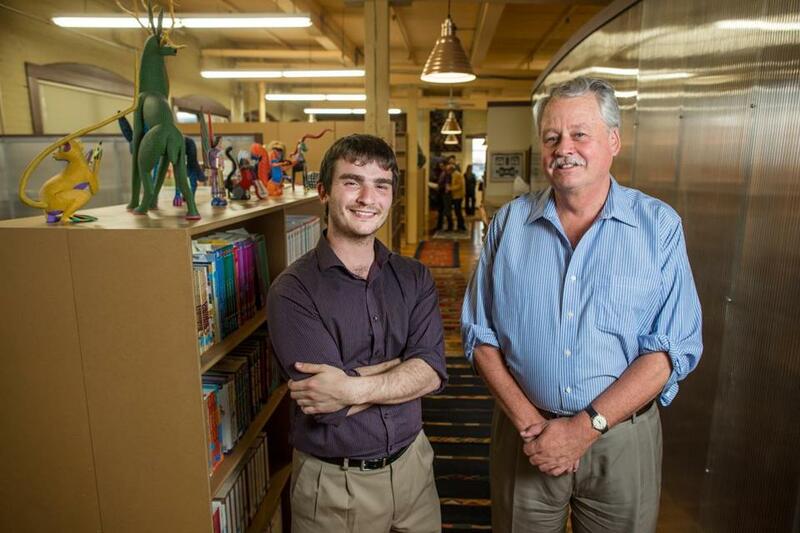 Adam Salomone (left) and Bruce Shaw in 2013 launched The Food Loft, a shared office space for food-based startups in their South End headquarters. If you’re a farmer growing fresh food, the conditions need to be just right to get from seed to harvest. And if you’re an entrepreneur nurturing a food-based startup, you need an ecosystem that gets you from the seed round to paydirt. Boston is increasingly becoming that fertile ground. The city is getting crowded with companies seeking to change the way we eat. There are indulgent ice cream brands and healthy beverage purveyors, “food-tech” entities using algorithms to track cattle or overhaul restaurant inventory systems, and high-minded food labs stealthily designing new recipes for major brands. 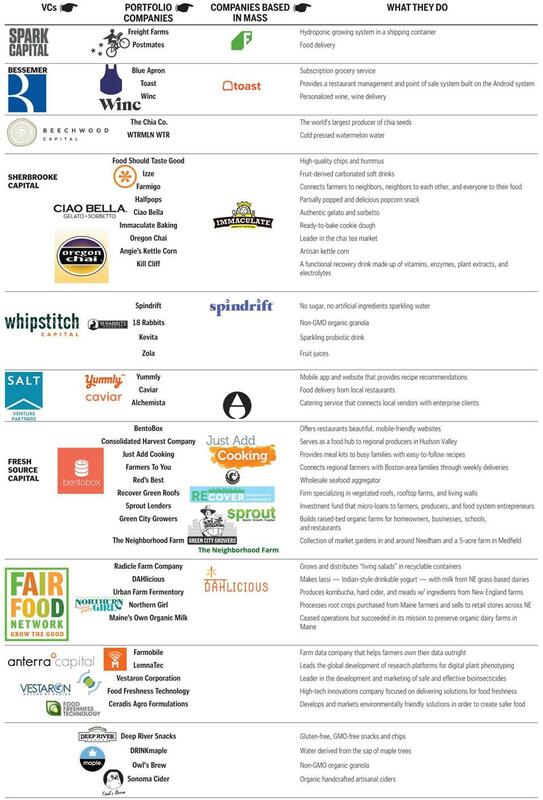 So it’s little surprise that the area’s venture capitalists have also begun to turn their attention to food. Deep-pocketed investors at Spark Capital and Bessemer Venture Partners have found success sowing their money into companies like Freight Farms and Blue Apron, respectively. Investors at Beechwood Capital, an established local player that made a fortune off the Crock-Pot, are now channeling their expertise into the next generation of eating. Meanwhile, a crop of new funds looking to invest exclusively in food-driven businesses has sprouted up around town. Jeremy Halpern, an attorney at Nutter McClennen & Fish who helped establish the firm’s food and beverage group, has been keeping close watch on the funding landscape here and says he’s seen its pace quicken in the past two years. “There’s not only new funds being created pretty rapidly, there’s also some of the existing funds pivoting,” he said. And he’s part of that change: Last fall, he launched his own food-focused angel fund, Edible Ventures. Kent Bennett is a partner at Cambridge-based Bessemer, an investor in Blue Apron (now a valued at $2 billion) and Toast, a local company that helps restaurants manage their point-of-sale operations. He said the move to underwrite these businesses stems from the primal nature of food. “I’m addicted to the stuff and can’t live without it,” he joked. It’s a sentiment echoed around the startup world. After years of betting on tech, venture capitalists in Silicon Valley and beyond have been looking for ways to disrupt the $5 trillion global food industry. In 2015, $6.8 billion was invested in private food-related startups and media, according to Brita Rosenheim, whose New York consulting firm, Rosenheim Advisors, obsessively tracks the food entrepreneurship space. “In the last two, maybe three years, there’s been this crazy tip” toward more funding in food, said Rachel Greenberger, who runs the Food Sol “action tank” at Babson College, which focuses on innovation and entrepreneurship within the food system. But she’s also among the skeptics who have watched as valuations soared then plummeted in the past year, as dozens of companies launched variations of two of the buzziest food businesses: on-demand food delivery and meal kit models. Greenberger said investing in the food industry comes with unique challenges, like fickle growing seasons and a reliance on fresh product. There’s an essential difference — when Amazon ships you a toaster, you know it’s not going to spoil. The same can’t be said for a meal kit. And it means that investors can’t just put their faith in technology alone. Who gets funded, and how, rests largely on the type of food business being built. Bessemer’s Bennett said many venture funds are “interested in massive industries that have the potential to be disrupted, and its tough to get into a bigger industry than food.” But they’re less apt to make a bet on a small baker or beverage maker that’s hoping to break out, he said. That where Halpern and Edible Ventures comes in. The local angel group, which launched in October of last year, wants to find the next VitaminWater or Honest Tea, both of which were eventually acquired by Coca-Cola. While margins for food businesses can be small, hitting on a promising consumer product can prove fruitful, Halpern said, in part because global food players like Campbell Soup, General Mills, and Kellogg’s have all opened their own venture arms within the last year in the hopes of scooping up smaller brands. Even so, the calculus has to be right to make a bet. So far, Edible Ventures has only invested in three brands: 18 Rabbits, a non-GMO granola bar; Owl’s Brew tea-based drink mixers; and Sonoma Cider, which makes organic alcoholic beverages. Several other local funds are looking to help burgeoning new consumer products expand their growth. Beechwood Capital, which helped build Crock-Pot’s parent company into an $800 million business, is now getting into cutting-edge food products such as ChiaPods and cold-pressed watermelon water. Sherbrooke Capital, which focuses on healthy lifestyle brands, is backing Food Should Taste Good chips and Izze Beverages. And Whipstitch Capital has helped a lineup of local food brands like the Otter Creek Brewing and Blake’s All Natural Foods navigate their acquisitions by bigger brands. There are also funds far more global in scope, such as Anterra, a joint venture from Fidelity and Rabobank, the EU-based food and agribusiness lender, which recently opened a Boston office for its $125 million fund. Its purpose is to finance agricultural startups seeking to overhaul food production systems. Lauren Abda of Branchfood has noticed that investors with a deep knowledge of food systems tend to have an edge. “Food is big, it’s complex, and having that depth of understanding gives the investors a leg up in how to coach the founders and make helpful introductions for them,” she said. That’s certainly been the case for Bruce Shaw, who spent the past 35 years as president and publisher of Harvard Common Press, which was best known for putting out food- and family-centric titles like Prairie Home Cooking and The Ultimate Rice Cooker Cookbook. In 2010, aware that the proliferation of recipes on the Web was about to undermine his business model, Shaw and his associate publisher, Adam Salomone, decided to invest in a recipe search engine, Yummly. The site now boasts 15 million unique visitors a month and has raised $24 million in outside investment. Having sampled a taste of the startup scene, Shaw and Salomone began to scout out new investments in food technology firms. In 2013, they opened The Food Loft, a shared office space for food-based startups in their South End headquarters. The following year, they invested in Caviar, a delivery app that was later purchased by the mobile payments company Square for a reported $90 million. Their investment group, Salt Venture Partners, has recently invested in Alchemista, a corporate catering startup that has been bringing meals to TripAdvisor and Wayfair. And while Salt Ventures is looking at new logistical models for restaurants and recipes, other more mission-driven funds like Fresh Source Capital and the Fair Food Fund are hoping to support smaller distributors and entrepreneurs attempting to bolster local food systems. Branchfood’s Abda said the scope of the funding network and the willingness of investors to keep supporting food businesses is not only critical to the success of today’s food innovators but to the next phase of food disruption. “It bodes well for the whole ecosystem,” she said.